Get a firecracker of a deal on tickets to a San Diego State University football game! 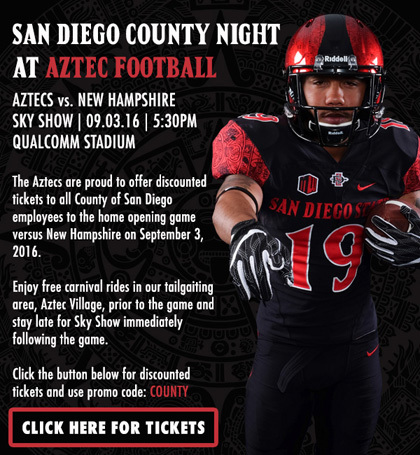 County employees can purchase tickets for $10 to SDSU’s 2016 season opener game against New Hampshire. The Sept. 3 game at Qualcomm Stadium will be followed by the 41st annual KGB SkyShow fireworks spectacular. Kick off for the Aztecs vs. the Wildcats is 5:30 p.m. Come early to enjoy free carnival rides in the tailgating area of Qualcomm’s parking lot prior to the game. The Aztecs are coming off an 11-3 season in which they tied a school record for the most wins in a single year and went on to beat Cincinnati in the Hawaii Bowl 42-7. Visit this Ticketmaster link and use promo code “COUNTY” to purchase tickets. This offer expires at 5 p.m., Sept. 2. You don’t need to wait until game day to support the Aztecs. Get pumped up for the game with a pep rally at the County Operations Center on Aug. 30. The SDSU Marching Band will drum up spirit starting at noon near the Commons.